Lock in a great price for Palette Resorts- Beira Mar Beach – rated 8.3 by recent guests! Proximity to the beach, cleanliness and ambience, Courteous staff, beautifully made up cottages. Hospitality, they infact decorated our room on my wife's birthday. Decent welcome drink. Super safe. Vendor contacts and general local help. Nice room Quiet Excellent location Quite nice breakfast especially the baked beans. The location and ambience is good. The food they provided is also good. Has beach access by 3minutes walk. Colva beach is also near via 15 minutes scooter ride. Professional staff, we like Joel at the Kitchen, he knows his craft well. Swimming pool which is perfect after enjoying the beach. Complimentary breakfast has good quantity. Onsite massage and spa. Restaurants are also available nearby at the beachfront. Hospitality of resort. Specially Mr Domnic is a great guy. Hassle free check in. Fat service. Great food. And lovely cottages and location. Best for peace loving people. 4.5 stars out of 5. The location is really great, but you would need your own vehicle. 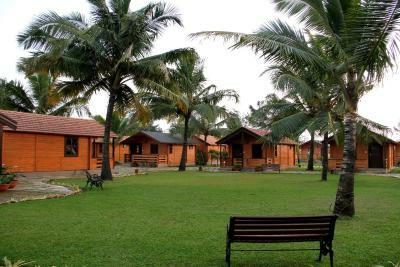 The resort is spread out with lawns, garden, children's play area etc. Beach is just a short walk away behind the resort and you can take bath in the sea easily. They also upgraded us to larger cottages after a confusing check in process. The food was good and decently priced. Our stay was amazing. With beach just 2 mins we can access it anytime. The staff were very friendly and the place is very beautiful. It is very calm n soothing. For us it was like a home away from our home. Great value for money, excellent location beach front property, well maintained, safe, clean, quiet, the restaurant "Pescador" in the Hotel was excellent. Used the Spa, simple and clean, nice facilities. The huts are in a safe area, our kids slept in one hut and the parents alone in another hut, no problem. Strongly recommend it. Checked out at noon and stayed in the pool until 19hrs before going to the airport. No Problem. Everyone was accommodating. Right on Benaulim Beach. Cottages were good. Resort is well maintained. The resort is located near the dead end of a road, hence away from the crowd. Has a rear entrance to the beach Very good privacy in the cottages. Looks like a quaint old town. Palette Resorts- Beira Mar Beach This rating is a reflection of how the property compares to the industry standard when it comes to price, facilities and services available. It's based on a self-evaluation by the property. Use this rating to help choose your stay! Offering an outdoor swimming pool, The Fern Beira Mar Resort is located at a 5-minute walk from Benaulim Beach. It operates a 24-hour front desk and features a well-manicured garden. Free Wi-Fi access is available in this resort. The air-conditioned accommodations will provide you with a flat-screen satellite TV and a seating area. There is also an electric kettle. Featuring a shower, private bathrooms also come with free toiletries. At The Fern Beira Mar Resort, other facilities offered at the property include tour desk and luggage storage. Services like laundry and dry cleaning are provided. The property offers free parking. If you feel like visiting the surroundings, check out Fort Aguada and Colva Beach that are at a distance of 3.1 mi. This resort is 4.3 mi from Madgaon Railway Station and 12 mi from Goa International Airport. Guests can enjoy a wide variety of Indian and International cuisines at Opescada. Room service is available for private dining. When would you like to stay at Palette Resorts- Beira Mar Beach? House Rules Palette Resorts- Beira Mar Beach takes special requests – add in the next step! Palette Resorts- Beira Mar Beach accepts these cards and reserves the right to temporarily hold an amount prior to arrival. Please note that the property has gala dinner charges for 31st December 2018 at INR 2000 AI per adult and INR 1000 AI per child (6 years to 12 years) to be paid directly at the property. Location and room. Clearly since detaching from fern franchise recently, there are in progress changes which are being fealty with, hopefully for the better. Sea is very close from resort. Food was excellent. Leaving.. the breakfast was a little limited & coffee was terrible but I accept its a tea country!! Breakfast is horror, almost uneatable for the entire duration of our stay, should be made optional. Wifi is poor. Food provided from restaurant is again uneatable. Crockery used is very basic and actually diminishes overall experience. Toilet area to small and crampt. Although being renovated and painted the tiles at edge of the pool were cracked/chipped/missing in parts otherwise I think I may have given higher scores. Breakfast was good, grounds kept well, nice pool and pool side area. The whole park like area that the cottages were in and the walk to the beach. As others have said, uncomfortable balcony chairs and noisy fridge. Overpriced, but New Year rates Gala dinner should have been optional. The in-house restaurant..being a good hotel ..the restaurant is not up to the mark. Few of the items in morning break fast are from previous night and warmed in microwave. Location and facilities are good. Place is clean and calm. Hardly 2 min from beach. Nice place to relax.